"Jane Douglass, Westbrook College, Class of 1973"
Westbrook College student Jane Douglass, Class of 1973, was a Medical Assistant major and a Day Hop. 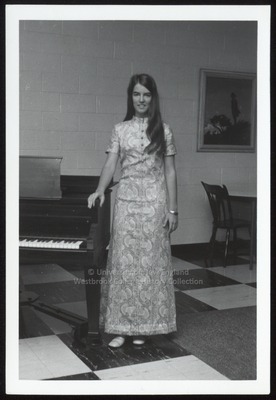 For her senior class candid photo, which appeared in the 1973 Tower Yearbook, she wore a maxi-dress with psychedelic pattern, mandarin collar and short sleeves. Her hair was long and parted in the middle. Jane poses in Wing Lounge beside a piano.